Our offer includes a handheld pressure meter to measure absolute pressure, negative pressure or differential pressure air and liquids. Each handheld pressure meter is controlled by a micro processor to guarantee the highest accuracy. 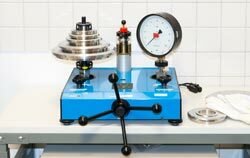 The pressure gauge displays results quickly and has an enclosure which is resistant to dust and water jet, making the device perfect for research and development. If you have any questions about a handheld pressure meter, please contact us at or +44 (0) 2380 987 035 for PCE Instruments UK or +1 (561) 320-9162 for PCE Americas Inc. The pressure meter PCE-PDA 01L is a reliable differential pressure gauge for pressure measurement of gasses in the range of ± 200 kPa. The pressure meter PCE-PDA 01L has many different pressure measuring functions. The pressure meter PCE-PDA 1L is a reliable differential pressure gauge for pressure measurement of gasses in the range of ± 2 kPa. The pressure meter PCE-PDA 1L has many different pressure measuring functions. The pressure meter PCE-PDA 10L is a reliable differential pressure gauge for pressure measurement of gases in the range of ±20 kPa. The pressure meter PCE-PDA 10L has many different pressure measuring functions. The pressure meter PCE-PDA 100L is a reliable differential pressure gauge for pressure measurement of gases in the range of -100 to +200 kPa. The pressure meter PCE-PDA 100L has many different pressure measuring functions. The pressure meter PCE-PDA A100L is suitable for the measurement of atmospheric pressure. This pressure meter records the pressure from absolute zero to 200 kPa. The pressure gauge can be used for many mobile applications in industry and crafts. The relative pressure meter PCE-PDA 1000L measures the relative pressure on machines and systems. The relative pressure is measured by this pressure meter in the range between -100 ... 2000 kPa. The relative pressure meter PCE-PDA 1000L has a quick coupling connection with which the air pressure or water pressure can be directly applied to the device. PCE-P01 is a portable handheld digital pressure meter or manometer used to measure differential pressure in pneumatic, compressor and pump installations, valves, tanks and heating, ventilation and air conditioning (HVAC) systems. The PCE-P01 displays min / max / average values right on the meter's screen for comparison against current measurement values. PCE-P15 is a pressure meter used to measure gauge pressure and true differential pressure in pneumatic, hydraulic, compressor and pump installations, valves, tanks and heating, ventilation and air conditioning (HVAC) systems. 11 pressure units are selectable for Imperial and Metric measurement, including bar, mmHg, ozin², kgcm², psi, inH2, kPa, ftH2O|, inHg, cmH2O and mbar. PCE-P30 is a pressure meter used to measure gauge pressure and true differential pressure in pneumatic, hydraulic, compressor and pump installations, valves, tanks and heating, ventilation and air conditioning (HVAC) systems. 11 pressure units are selectable for Imperial and Metric measurement, including bar, mmHg, ozin², kgcm², psi, inH2, kPa, ftH2O|, inHg, cmH2O and mbar. PCE-P50 is a pressure meter used to measure gauge pressure and true differential pressure in pneumatic, hydraulic, compressor and pump installations, valves, tanks and heating, ventilation and air conditioning (HVAC) systems. 11 pressure units are selectable for Imperial and Metric measurement, including bar, mmHg, ozin², kgcm², psi, inH2, kPa, ftH2O|, inHg, cmH2O and mbar. As a customer, you can always call the technical consulting hotline of PCE Instruments. The colleagues will ask you specific questions about your application and suggest the best suited products for the solution of your measuring task. Below you will also find some tips which you should take into consideration when selecting or purchasing a handheld pressure meter. The essential criteria, by which a pressure meter should be selected, are the display range and the resistance of the materials against temperature, measuring medium and environment. Do you need an analog or a digital display? In our product range you will find pressure meters with analogue and digital displays. Due to the mechanical measuring principle of the analog pressure meters, time-intensive cost factors for maintenance are no longer required. Because of the shock-proof and robust housing, the analog pressure meters are mostly applied in workshops or in industry. A further advantage of a analog pressure meter is in the ease of use – you only have to screw the analog pressure meter into the pressure system and read the measured value from the analog display. Our digital pressure meters are battery operated and, therefore, are ideal for mobile use. The measured values can be displayed in the units of bar, psi, Pa, or Mpa (in a handheld pressure meter up to 11 units possible). The digital pressure meter offered by PCE Instruments have various functions, for example, storing the Min-Max values or an automatic shutdown. In general, in case of a pressure meter, a distinction is made between absolute, relative and differential pressure. The absolute pressure refers to the pressure zero in the vacuum and is particularly interesting for air pressure measurements. To measure an absolute pressure, you can use altimeters and barometers available in our products range. The relative pressure is divided into overpressure and negative pressure. If the air pressure of 0 bar is assumed, positive values are obtained for the pressure above it, which is referred to as overpressure. If the value is below the air pressure of 0 bar, we get a negative value and we then speak of a negative pressure. In practice, manometers are most commonly used for the determination of relative pressure. The main feature of a differential pressure manometer is the two separate pressure connections, for example, for measuring the pressure before and after pumps. A differential pressure meter is often used there, where pressures are compared with each other. This can be in the case of a sluice in order to control fans, to detect the pressure in front of and behind a filter to determine the degree of soiling or also air speed, with the help of a pitot tube. To measure the differential pressure, you can use a handheld pressure meter presented in our products range. Which medium should the measurements be carried out in? When selecting your handheld pressure meter, please consider, which medium it should be used for. The pressure meters we offer can measure the pressure in the air, liquids and gases. In the technical specifications of pressure meters, you can see with which medium each device is compatible. Some of our pressure meters have to be configured accordingly. Safety note: with a pressure meter it is strictly prohibited to conduct measurements of explosive and corrosive gases or liquids! Do you need a built-in or a handheld unit? Depending on the application, at PCE Instruments, in the category Pressure Meter, you will find a large selection of built-in and handheld instruments. Our stationary devices are ideal for the continuous monitoring of pressure in various application fields. In addition, stationary pressure meters are particularly robust and therefore are ideal for harsh industrial environments. Some of our measuring instruments have an analogue output, which is configurable as, for example, 4 ... 20mA or as 0 ... 10V. These differential pressure sensors are often used in control technology. If you need a flexible instruments for spot-like measurements, you should opt for our handheld pressure meter. In our shop you will find mobile pressure meters for the application in the laboratory, for monitoring an outdoor installation or wherever some flexible measuring devices are required. A handheld pressure meter is supplied with software, it means that later the recorded data can be evaluated on the PC. This information is often used for quality control, troubleshooting, or printout in documents. Other important criteria when selecting a pressure meter are measuring range and accuracy. It should be noted that the pressure to be expected should lie in the middle third of the pressure meter's display range. Our stationary pressure gauges have a measuring range of 0.1 to 600 bar and are divided into the accuracy classes 0.05 / 0.1 / 0.2 and 0.5. The mobile differential pressure gauges of the PCE series can measure pressures of +/- 1,000 to +/- 7,000 mbar with an accuracy of 0.3% or 2%. 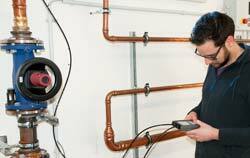 The stationary pressure meters have different connections and diaphragms, that is why you should take a look at the technical data of our devices or ask one of our technicians for advice. A pressure meter is suitable for different liquids or gases depending on different diaphragms and is optionally supplied with a ceramic or a stainless-steel membrane. Depending on the device, you have a choice of up to 6 different threaded connections, for example G ½ "DIN 3852 or ¼" NPT. In our Online-shop, you can select the desired thread and configure the pressure meter individually for your use. The pressure meter is used to measure absolute pressure or atmospheric pressure of air, gases or / and liquids. Please ensure that you always use the right pressure meter for your application. The pressure meter or also manometer is the name of a device that measures and displays the physical pressure of a medium (liquid, gas). Most of the pressure meters use the air pressure as reference, only special designed pressure meters like a barometer uses the vacuum as reference. The offered pressure meters work with positive pressure and also with negative pressure. We can provide pressure meters for absolute pressure or differential pressure and also barometers or meters to measure the wind speed. 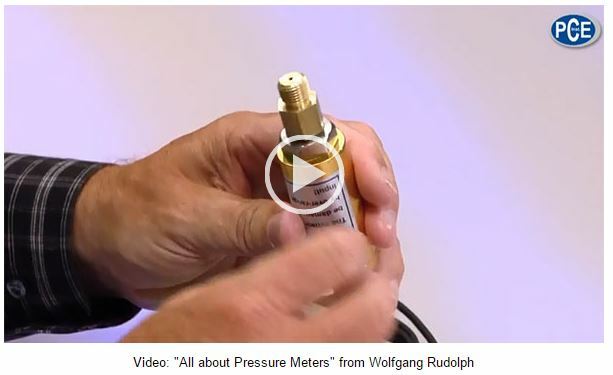 The above links give you a classic overview of these pressure meters. A common use of the pressure meters is the industry, trade, craft and also in the research industry for example to measure the pressure of a container, pressure in a ventilation system, differential pressure of a pump, etc. Another way of measuring pressure is traction force. In this application the measuring result is not displayed in bar, Pa, etc., it is measured in Newton (N) where the pressure is often in relation to an area (surface pressure or area load). The relation to the area is displayed in N/mm² for example.